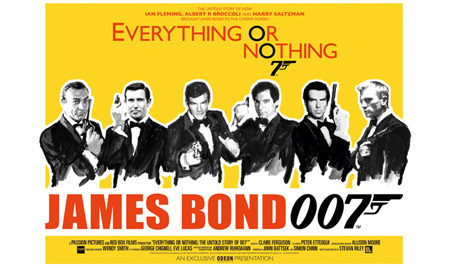 Everything Or Nothing: The Untold Story Of 007 feature documentary is to be released October 5, 2012 as part of the events of GLOBAL JAMES BOND DAY. Metro-Goldwyn-Mayer Pictures, Columbia Pictures, Passion Pictures and Red Box Films are proud to announce their new feature documentary Everything Or Nothing: The Untold Story Of 007 directed by Stevan Riley (Fire In Babylon), produced by John Battsek (One Day In September, The Tillman Story) and Simon Chinn (Man On Wire, Project Nim) to coincide with the 50th anniversary of James Bond films on October 5. In the UK, the film will be released through Sony Pictures Releasing UK on an exclusive basis with Odeon Cinemas in selected locations. 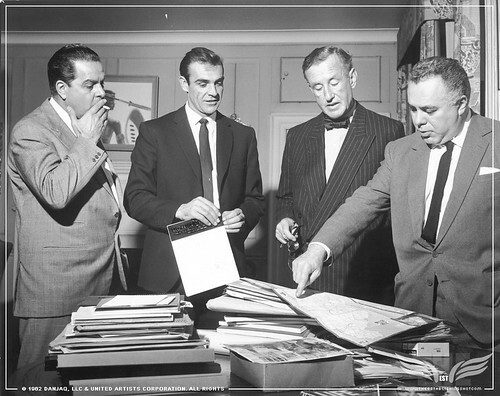 The Establishing Shot CUBBY BROCCOLI, SEAN CONNERY, IAN FLEMING & HARRY SALTZMAN STUDY A MAP OF JAMAICA WHILST SHOOTING DR. NO. © 1962 Danjaq, LLC & United Artists Corporation. All rights copy, a photo by Craig Grobler on Flickr. Everything Or Nothing: The Untold Story Of 007 focuses on three men with a shared dream – Bond producers Albert R. Broccoli, Harry Saltzman and author Ian Fleming. 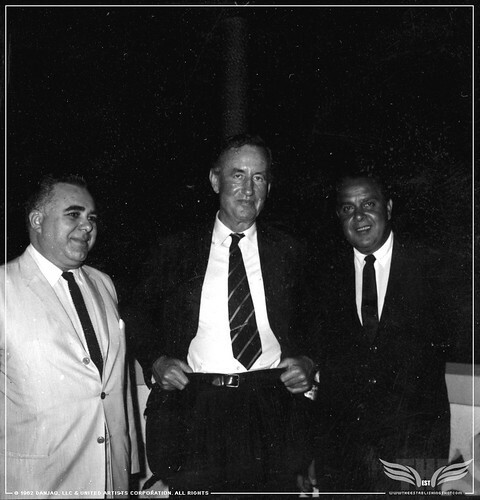 The Establishing Shot HARRY SALTZMAN, IAN FLEMING & CUBBY BROCCOLI IN JAMAICA WHILST SHOOTING DR. NO. © 1962 Danjaq, LLC & United Artists Corporation. 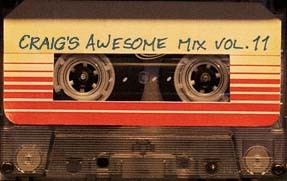 All rights © 1962 Danjaq, LLC & United Artists Corporation, a photo by Craig Grobler on Flickr. It’s the thrilling and inspiring narrative behind the longest running film franchise in cinema history which began in 1962. 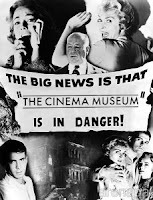 With unprecedented access both to the key players involved and to Eon Productions’ extensive archive, this is the first time the inside story of the franchise has ever been told on screen in this way. Director Stevan Riley follows a story that begins with a ground-breaking spy thriller and continues six Bonds and five decades later. 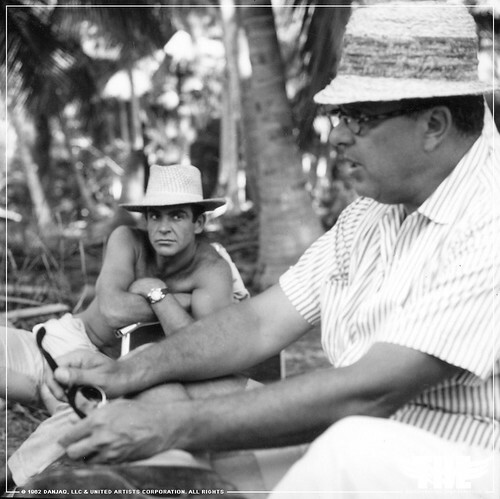 The Establishing Shot CUBBY BROCCOLI & SEAN CONNERY ON THE SET OF DR. NO, JAMACIA. © 1962 DANJAQ, LLC & UNITED ARTISTS CORPORATION. ALL RIGHTS, a photo by Craig Grobler on Flickr. While Bond was saving the world from chaos and catastrophe on screen, this compelling documentary draws back the curtain to reveal the battles, threats and real stakes unfolding behind the camera. 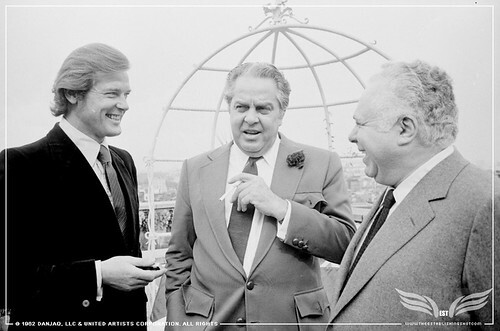 The Establishing Shot SIR ROGER MOORE, CUBBY BROCCOLI & HARRY SALTZMAN SHOOTING LIVE AND LET DIE © 1962 Danjaq, LLC & United Artists Corporation. All rights, a photo by Craig Grobler on Flickr. Further worldwide events celebrating Bond’s golden anniversary include a global online and live auction charity event of 50 lots to benefit twelve charitable institutions organized by Christie´s in London (full details at www.christies.com/bond), a global survey to discover the favorite Bond film by country, a film retrospective at the Museum of Modern Art in New York, a Music of Bond night in Los Angeles hosted by the Academy of Motion Picture Arts and Sciences, and an exhibition, “Designing 007: 50 Years of Bond Style,” at TIFF in Toronto. Leading up to Global James Bond Day, for the first time ever fans can own all 22 films in the franchise on Blu-ray Disc in one comprehensive collection with BOND 50, releasing worldwide beginning September 24. 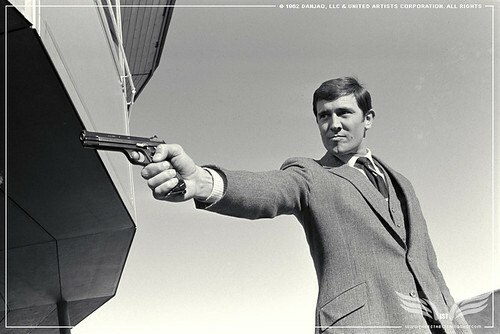 Further updates by country will be announced in due course on 007.com and facebook/JamesBond007. The Establishing Shot GEORGE LAZENBY SHOOTING ON HER MAJESTY'S SECRET SERVICE IN MURREN SWITZERLAND. © 1962 Danjaq, LLC & United Artists Corporation. All rights, a photo by Craig Grobler on Flickr.